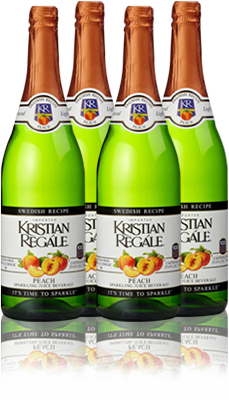 For the fresh taste of real peaches, try Kristian Regále Peach Sparkler. We use delicious, all natural peach juice in our special recipe. The taste of peaches means that summer is here. Our Peach Sparkler is the perfect complement to anything barbequed. Purified sparkling water, peach concentrate, beet sugar, citric acid, natural flavors, ascorbic acid.